Type and Characteristics - Sailing frigate, built on the keel of the first USS Macedonian by Norfolk Navy Yard, Portsmouth, VA, started in 1832, in service 1836, 1,341 long tons, 164ft long x 41ft beam x 21ft 6in draft, armed with 36 guns (believed converted to sloop with guns reduced to 22 for the expedition to Japan), 489 crew, first commanded by Captain Thomas ap Catesby Jones. Log Period and Areas of Service - 1853-55, Perry's Expedition to Japan, Pacific Patrol. 1852 - Docked at Brooklyn Navy Yard for conversion to sloop for planned expedition to Japan. Assigned to East India Squadron. 13 February 1854 - With Capt Joel Abbott in command, entered Tokyo Bay with Cdre Perry on his second visit. 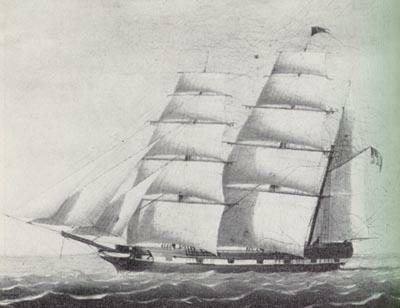 1854-57 - Remained on patrol in North Pacific. Fate: Laid up at Norfolk Navy Yard in 1871, sold for merchant service in 1875.